The 79-year-old has vowed to lead the organisation out of the corruption “storm” it has become embroiled in. 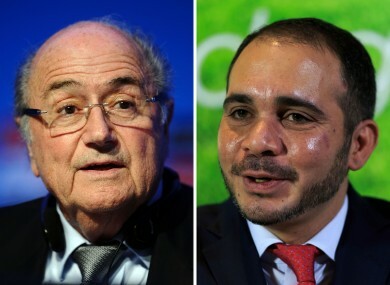 File photos of the two contenders in the FIFA presidential election Sepp Blatter (left) and Prince Ali Bin Al Hussein (right). SEPP BLATTER HAS been elected as Fifa president for a fifth term, after opponent Prince Ali bin al Hussein conceded the vote. The election had originally been expected to go to a second round after Sepp Blatter narrowly failed to win the two-thirds majority of votes needed to win outright in the initial voting. However, with little chance of a dramatic turnaround, Prince Ali conceded, paving the way for Blatter’s re-election. The current president received 133 first-round votes in today’s congress, against his opponent, who received 73 votes. The Fifa congress on Friday started a vote for a new president with incumbent Sepp Blatter the favourite despite a major corruption scandal engulfing the organisation. Blatter’s challenger Prince Ali had campaigned on the need for reform at the multi-billion dollar world body, which has faced a series of scandals in recent years. The vote started at 1505 GMT (1605 Irish time) and took over one hour. Blatter vowed to lead Fifa out of the corruption “storm” it has become embroiled in. The body was rocked by the arrest of seven officials in Zurich on Wednesday. “I am held responsible for the storm. OK yes I accept this responsibility,” he told a Fifa congress. “I promise a strong Fifa, I want to climb back up the hill, arrange Fifa’s situation. I want a beautiful Fifa, strong out of the storm,” he said before voting started. Prince Ali had promised to establish “transparency”. The Jordanian prince said he would “restore respect for the body we represent” after the corruption scandals that have hit Fifa this week. Before the vote started, Blatter shook hands with the prince as part of ceremonies for officials leaving the Fifa executive committee. The prince has been a Fifa vice president but did not stand for a new term. Email “Sepp Blatter elected for fifth term as Fifa president after Prince Ali concedes”. Feedback on “Sepp Blatter elected for fifth term as Fifa president after Prince Ali concedes”.